"Phenomena" redirects here. For other uses, see Phenomena (disambiguation). "Phenomenal" redirects here. For other uses, see Phenomenal (disambiguation). For the film, see Phenomenon (film). A phenomenon (Greek: φαινόμενον, phainómenon, from the verb phainein, to show, shine, appear, to be manifest or manifest itself, plural phenomena) is any thing which manifests itself. Phenomena are often, but not always, understood as "things that appear" or "experiences" for a sentient being, or in principle may be so. The term came into its modern philosophical usage through Immanuel Kant, who contrasted it with the noumenon. In contrast to a phenomenon, a noumenon cannot be directly observed. Kant was heavily influenced by Gottfried Wilhelm Leibniz in this part of his philosophy, in which phenomenon and noumenon serve as interrelated technical terms. Far predating this, the ancient Greek Pyrrhonist philosopher Sextus Empiricus also used phenomenon and noumenon as interrelated technical terms. 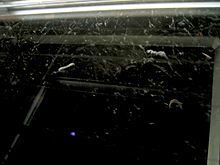 Cloud chamber phenomena. Scientists use phenomena to refine some hypotheses and sometimes to disprove a theory. See also animated version. In modern philosophical use, the term phenomena has come to mean 'what is experienced is the basis of reality'. In Immanuel Kant's inaugural dissertation, On the Form and Principles of the Sensible and Intelligible World (1770), Kant theorizes that the human mind is restricted to the logical world and thus can only interpret and understand occurrences according to their physical appearances. He wrote that humans could infer only as much as their senses allowed, but not experience the actual object itself. Thus, the term phenomenon refers to any incident deserving of inquiry and investigation, especially events that are particularly unusual or of distinctive importance. According to the Columbia Encyclopedia, "Modern philosophers have used 'phenomenon' to designate what is apprehended before judgment is applied." This may not be possible if observation is theory laden. The combustion of a match is an observable occurrence, or event, and therefore a phenomenon. 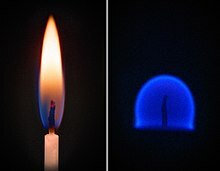 A comparison between a candle flame on Earth (left) and in a microgravity environment, such as that found on the International Space Station (right). The same burning phenomenon is observed, but different flame shape and colouring phenomena are also observed. In scientific usage, a phenomenon is any event that is observable, however common it might be, even if it requires the use of instrumentation to observe, record, or compile data concerning it. For example, in physics, a phenomenon may be described by a system of information related to matter, energy, or spacetime, such as Isaac Newton's observations of the moon's orbit and of gravity, or Galileo Galilei's observations of the motion of a pendulum. In natural sciences, a phenomenon is an observable happening or event. Often, this term is used without considering the causes of a particular event. Example of a physical phenomena is an observable phenomenon of the lunar orbit or the phenomenon of oscillations of a pendulum. A mechanical phenomenon is a physical phenomenon associated with the equilibrium or motion of objects. Some examples are Newton's cradle, engines, and double pendulums. Group phenomena concern the behavior of a particular group of individual entities, usually organisms and most especially people. The behavior of individuals often changes in a group setting in various ways, and a group may have its own behaviors not possible for an individual because of the herd mentality. Social phenomena apply especially to organisms and people in that subjective states are implicit in the term. Attitudes and events particular to a group may have effects beyond the group, and either be adapted by the larger society, or seen as aberrant, being punished or shunned. In popular usage, a phenomenon often refers to an extraordinary event. The term is most commonly used to refer to occurrences that at first defy explanation or baffle the observer. According to the Dictionary of Visual Discourse, "In ordinary language 'phenomenon/phenomena' refer to any occurrence worthy of note and investigation, typically an untoward or unusual event, person or fact that is of special significance or otherwise notable." ^ a b c "Phenomenon/Phenomena". Dictionary of Visual Discourse: A Dialectical Lexicon of Terms. 2011. ^ "Phenomenon". The Columbia Encyclopedia. 2008. ^ Bernstein, Jeremy (1996). A Theory for Everything, Copernicus, An imprint of Springer». New York. ^ "Mechanical phenomenon". Audioenglish.net. Retrieved 23 May 2011. This page was last edited on 23 March 2019, at 19:31 (UTC).